Early stage risk investments fund Superangel and Eesti Õigusbüroo concluded an investment contract according to which the fund will contribute to the creation of the legal aid platform and its launch at foreign markets. The process of purchase and sale of the legal aid service will become simpler, more transparent and affordable. This weekend Eesti Õigusbüroo participated in #BaseCamp haketon, where, within 48 hours, our IT developers in cooperation with lawyers built the first Estonian robot-lawyer that can help to prepare response letters to claims sent by collection firms. The service is free of charge for people. Robot-lawyer Juura operates via Messenger environment and finally generates a document for the person it is talking to and as the result, the document is delivered to the collection firm and starts a process, which result may ultimately lead to a decreased claim. The first robot-lawyer of this kind in the world was created in the United Kingdom in 2015. The robot’s name was DoNotPay and it helped to dispute parking tickets. Parking tickets are the most common problem in Great Britain like collection claims in Estonia. 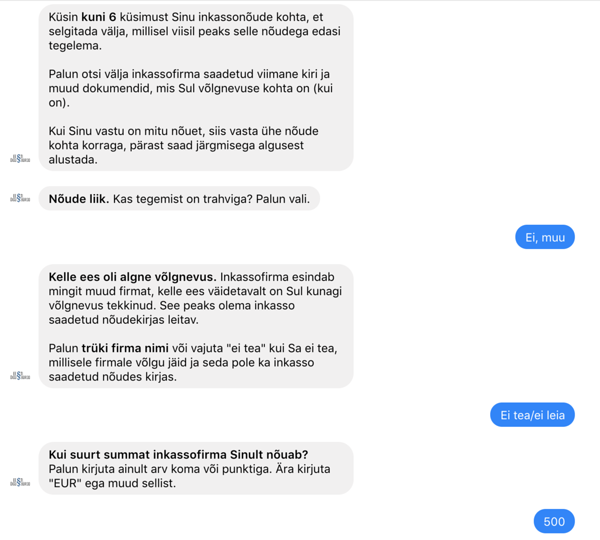 According to Artur Fjodorov – the Chief Executive of Eesti Õigusbüroo and the instigator of the robot-lawyer, collateral claims are so huge that a person who owes 10 EUR has to pay 100 EUR together with the collateral claims. “Based on the analysis of the review prepared by the Ministry of Economics and Communications, the range of collateral claims of collection firms is in between 80-90%. Rather frequently people have to pay 10-20 times more than the actual debt is. According to the same analysis extrajudicially about 38 000 people are claimed 24 million EUR of which 80% is pure air or unfounded claims. The most astonishing is the fact that 85% of people never dispute their claims and pay the entire sum claimed. This statistical data is five years old and by today the scope has increased several times,” said Fjodorov. Fjodorov is worried because people do not know their rights and cannot protect themselves. “People are used to think that the service of a lawyer is expensive and they cannot afford it and concurrently the collection firms take advantage of people’s ignorance. We have developed them a tool they can use for writing responses to collection firms and it can be done comfortably and totally free of charge in Messenger environment,” added Fjodorov. One can communicate with Juura on the homepage of Eesti Õigusbüroo www.juristaitab.ee or in the conversation window of the Facebook page of Eesti Õigusbüroo. The direct link to Juura is at m.me/juristaitab.ee Eesti Õigusbüroo is one of the biggest legal offices in Estonia, which provides help in cooperation with the Ministry of Justice to all people living in Estonia since April 2017 free of charge or legal aid on favourable conditions. All people living in Estonia, whose gross income remains below 1.5 average gross income established by the Statistics Board (i.e. below 1981.5 EUR), are eligible for this aid.